Oh what fun it is! 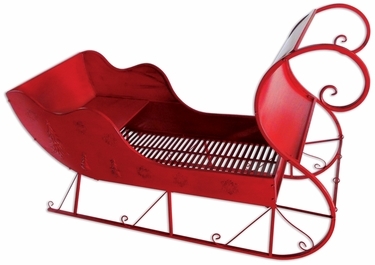 This decorative sleigh will have you singing jingle bells all the way through the New Year! This wonderfully large 63" Metal Christmas Sleigh Decorative features scrolling details on the runners and is embellished with snowflakes and Christmas tree shaped accents on the sides. Together in minutes with easy assembly and ready to enjoy all Winter long! Great for Christmas decorating indoors or out, it will help get you in the holiday spirit! Use alone, or coordinate with other decorations, and fill your home or office with festive cheer. Fill with holiday stuffed animals, presents at a gift exchange, and more! Not for and rides, decorative use only. Holds up to 100 pounds. Stands 38" tall, 24" wide, and 63" long. Weight 58 lbs. Perfect when filled with presents and decor!